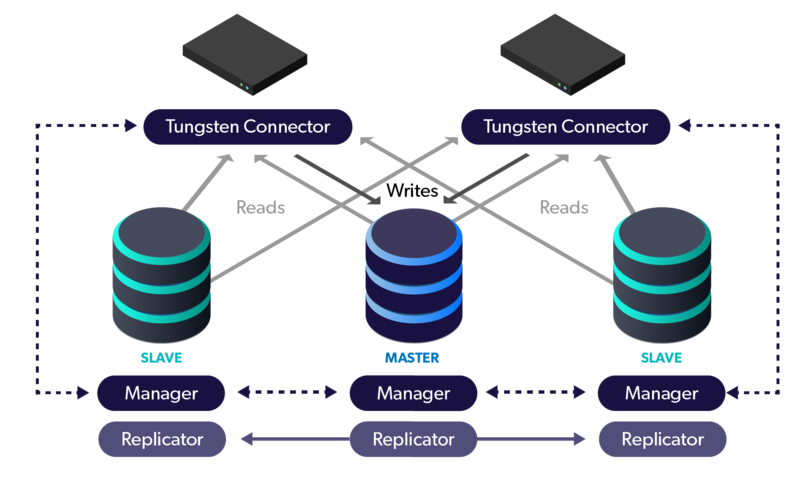 You already know about the Tungsten Connector which is the “secret sauce” that routes your application database traffic to the appropriate MySQL data source of your cluster. Have you ever wondered how the Connector keeps track of the cluster configuration? How it always knows which host is the master (or masters in a Composite Multimaster topology), and which are slaves? This information is actually held and maintained by the Managers, which monitor and take care of their local MySQL node. Each one of the Connectors maintains a single connection to one, and only one, manager per data service. In the case of a Composite Multimaster topology, that will be one Manager chosen per site. What if I want the cluster to be less sensitive to network, especially WAN latency? Continuent Clustering supports having clusters at multiple sites with active-active replication meshing them together. This is extraordinarily powerful, yet at times high network latency can make it harder for messaging between the sites to arrive in a timely manner. Clustered computing brings with it many benefits: high performance, high availability, scalable infrastructure, etc. But it also brings with it more complexity. Well, by its very nature, there are more “moving parts” to monitor and manage (from physical, virtual and logical hosts) to clustering software to redundant networking components – the list goes on. And a cluster that isn’t effectively provisioned and managed will cause more downtime than the standalone systems it is designed to improve upon. When it comes to the database industry, analysts already estimate that 50% of a typical database’s Total Cost of Ownership is attributable to staffing and downtime costs. These costs will only increase if a database cluster is not effectively monitored and managed. The MySQL Community Team is hiring! Oracle investment in MySQL is growing, and so is our emphasis on community presence, participation, and leadership. We need now your help. Our team at Oracle needs to grow in order to support community better, and we are starting by filling the position for MySQL community manager in a place with a significantly large MySQL user base: North America. Sun's LAMP support is assembled from two pieces: the L is from our Linux/GNU Support (see SunSolve entry), while the AMP comes from the GlassFish WebStack, which, in its latest incarnation includes Apache HTTP Server, lighttpd, memcached, MySQL, PHP, Python, Ruby, Squid, Tomcat, GlassFish (v2.1) and Hudson (features). Real checks timeouts - I’ve found and fixed lots of problems in checks timeout code and now if you specified in your mmm_mon.conf, that some check should timeout in 5 sec, it would timeout correctly on all supported platforms. External third-party tools using - On all supported non-linux platforms mmm will use system binaries for fping and arp_ping so porting to another platforms would be much easier.